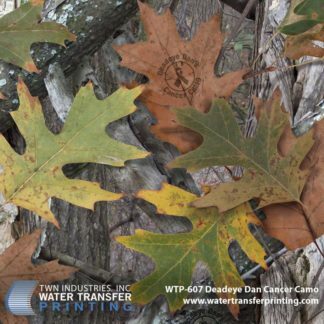 PRINCETON, FL – May 17, 2012 – TWN Industries Inc, the leading water transfer printing supplier is releasing Dead Eye Dan’s Cancer Camo water transfer printing film. A portion of the sales of this hydrographic film will be donated to cancer research, while another portion will be given to various charities to help cancer patients become active outdoors. The water transfer printing process transforms rifles and other products by applying high definition graphic patterns to three dimensional hard surfaces. Deadeye Dan’s Cancer Camo was created by Pennsylvania ordained minister Dan Robatin. Deadeye Dan is known in his community as an outdoor enthusiast and frequently speaks at hunting related events. His camouflage pattern features colorful oak leaves over moss covered tree branches. The range of colors in the pattern allow for concealment in the woods during any season. The different colors and imperfections of the oak leaves symbolize different types of cancer while the ribbon logos represent the slogan “Taking an Aim at a Cure”. Cancer Camo was designed in honor and in loving memory of Deadeye Dan’s father, Joseph Robatin, who suffered and lost his life to Leukemia in 1999. Deadeye Dan’s mission is to design more camouflage patterns to benefit other charities who work to improve the community. “My father planned on doing a lot of outdoor activities upon retirement. Unfortunately, he didn’t survive long enough to do that. Through the memory of him and this pattern, Deadeye Dan’s Cancer Camo is helping others do what my father couldn’t. Enjoy the Outdoors!” declared Dan Robatin, creator and owner of Deadeye Dan. Deadeye Dan’s Cancer Camo is available exclusively from TWN Industries, Inc. Three meter accessory packs available immediately, part number is WTP-607. To find a TWN Certified Processor to decorate parts for you or to order film, call 305-258-9622.